Carmen Browne is an African American contemporary jazz singer and songwriter living in Dublin,Ireland. 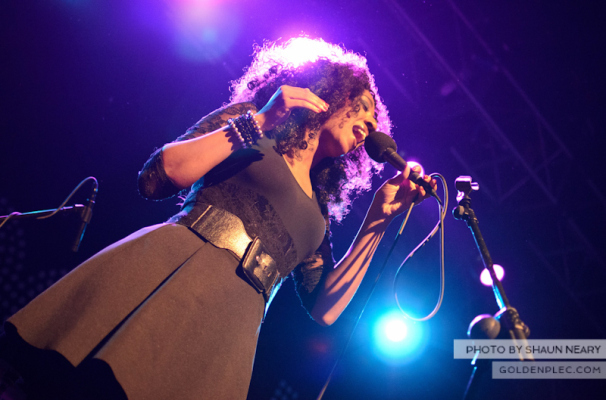 Her voice has often been compared to Sade and her composition style has been likened to Jamie Cullum or Nina Simone. She was the winner of the 2012 RAAP/RTE Breakthrough Bursary Award, a national honour which was held in Ireland’s National broadcasting station RTE. Browne was born in Bloomington, Indiana, sharing a birthplace with Hoagy Charmichael amongst other artists and she was brought up by her two parents. Her mother, from New Orleans, was a social worker and her father was the first Black police officer in Bloomington. Her parents later divorced and her mother remarried. Her career started in earnest at age 6 when, to her mother’s surprise, she lined up with the adult church choir, performing all the songs and motions in sync. Carmen went on to study Voice Performance and Elementary (primary) Education at Indiana University, singing with several award-winning choirs, including the African American Choral Ensemble and Sojourner, and as a featured soloist with the Cincinnati Pops Orchestra. She came to Ireland as a student teacher to get an international experience before she started her adult life, but ended up moving to Ireland permanently. Carmen started her professional musical career a few years after her step-father took his own life. She discovered that the very act of singing, something she loved to do yet had temporarily put aside in grief, had a healing effect on her stating, “I had an overwhelming feeling that this physical life is short. I believe there is a message I am supposed to convey to the world and there are a lot of people who could connect with it.” Her songs focus on positivity and the delicious benefits of being an adult in a world that idolizes inexperience. She believes that a singer is part storyteller, part messenger and part missionary. For Carmen, that mission has meant living the story. Her Irish ancestors left Galway in the 19th century and merged with her African and French ancestors in Louisiana. Though she spent her youth running through the cornfields of Indiana, something – music? storytelling? – drew her to Ireland, where she has recorded with Adrian Fitsimons, the award-winning North Dublin Community Gospel Choir, Nigel Mooney and been mentored by renowned Irish vocalist Honor Heffernan. Her performance highlights have included being the opening act for M People and Billy Ocean in Dublin’s Vicar Street Venue. She has been the headliner in Dublin’s Workman’s Club and The Grand Social, a featured performer at the Dublin Soul Picnic Festival and the Bray Jazz Festival. Carmen was also accepted on the 3 week jazz workshop at Banff in Alberta, Canada where she shared a stage and studied closely with Vijay Iyer, Imani Uzuri, Jen Shyu, Padmashri Aruna Sairam, Steve Coleman, Tyshawn Sorey, Marcus Gilmore and Ambrose Akinamusire. Carmen’s self-composed songs evoke a relaxed image. Her luxurious, dreamy soundscape belies the formality of her training, allowing anyone who listens to bask in their own hopes and dreams. *Photo by the fabulous Shaun Neary originally published on goldenplec.com.